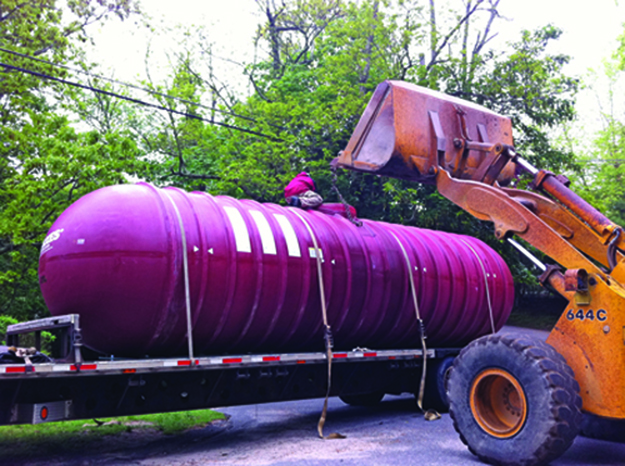 PETER REICH PHOTO | A 10,000-gallon cistern delivered and buried at a residence in the Heights for off-Island water storage. Shelter Island’s Water Advisory Committee will take a hard look next month at the planned ban on new underground irrigation systems. The ban is slated to take effect in September, but committee member Walter Richards has been expressing doubts about its enforceability. At Monday night’s meeting, he suggested that existing irrigation systems might be grandfathered so they wouldn’t have to comply with the law that requires the use of cisterns fed by off-Island water to avoid using groundwater to irrigate lawns and gardens. There are 128 legally licensed underground irrigation systems installed on Shelter Island and about 20 that have no license, according to Town Supervisor Jim Dougherty, liaison to the WAC. Most are installed in “the most vulnerable areas” of the Island, he said. The committee has talked about the pending ban from time to time but has yet to make any formal recommendations to the Town Board. Mr. Dougherty told members Monday night he expects the Town Board to begin its talks about the legislation in April. It would be helpful to have input from the WAC at that time, he said. In January, Mr. Richards, a Shelter Island Police officer, said he thought the ban would be difficult to enforce. The new law calls for cisterns to be filled with clean water from an off-Island source, but even if the town could assure that’s being done, Mr. Richards has concerns about whether the cisterns would be used properly to ensure they’re doing the job intended. In 2003 an earlier Town Board passed the legislation that’s intended to protect the Island from drought conditions. It immediately banned new irrigation systems unless they had cisterns fed by off-Island water. But it included the provision that as of September 2013, no new underground irrigation systems would be allowed. Mr. Dougherty has called that move “visionary” and said it now falls to the current Town Board to take the steps necessary to ensuring that the Island’s water supply remains adequate. Shelter Island has been successful in protecting well water so it doesn’t have to connect to the Suffolk County Water Authority system. Despite the intent of the law to continue to protect the Island’s narrow and shallow aquifer, there have been some who have lobbied the Town Board to reverse the law before it takes full effect in September. REPORTER FILE PHOTO | FEMA officals met with the Town Board to discuss recovery efforts from Hurricane Sandy. The federal government descended on the Town Board at Tuesday’s work session. The Federal Emergency Management Agency (FEMA), in the form of a baker’s dozen of officials, came to talk about recovery efforts from Hurricane Sandy and plans for future crises brought on by Mother Nature. Also on the agenda was raising town fees, with agreement that some things are going to cost more on Shelter Island. The meeting opened with the voice of Supervisor Jim Dougherty on speakerphone. The supervisor has been absent from Town Hall for weeks, hospitalized for a viral infection while battling non-Hodgkin’s lymphoma. He thanked the board for picking up the slack and said he had made a decision to put his wife, Nancy, who has been suffering from an extended illness, into hospice care. Deputy Supervisor Christine Lewis then welcomed the FEMA team. Curtis Vreeland, a deputy director of the federal agency described their presence as “a kickoff meeting,” explaining to the board what’s called the “National Disaster Recovery Framework,” a post-Katrina effort to coordinate all federal agencies to help communities in recovery efforts. Police Chief Jim Read, who also heads the town’s emergency management committee, said Shelter Island has applied to be reimbursed $350,000 it spent on the response to, and recovery from, Hurricane Sandy. In the past the federal government, if it approved, would foot 75 percent of the bill and the state and town kicked in the balance. Now that’s changed to a 90 percent federal reimbursement, if approved, and the state and town picking up the remaining 10 percent. It might even work out that the state will take on the remaining 10 percent, but if not, the town will be on the hook for only 5 percent, the chief said. Bryan Starr, community recovery specialist for FEMA, likened the agency to a corporation with $50 billion dollars – the amount approved by Congress for Sandy recovery efforts — to spend in four states. “Our profit is when you create a more resilient and sustainable community and are prepared for the future,” Mr. Starr said. There were grants available for almost everything, Mr. Starr said, including re-landscaping town halls. The official reiterated this was a preliminary meeting and the town should do an inventory of needs for the future and present it to FEMA at future meetings. Chief Read mentioned that doing an inventory of needs requires time and effort that will be imposed on an undermanned staff. The board turned to town fees when the visitors exited, with members agreeing it was a necessary evil to raise some of the more than 200 fees on the books. Councilman Peter Reich suggested looking at fees that have not changed over an extended period, such as commercial and private mooring applications, with some remaining at the same level for 13 years. Councilman Ed Brown thought raising some fees for special exceptions on huge building projects should be on a sliding scale. Also discussed was raising some parking fees for beach access, with the board discussing rates for week and weekend parking fees. Councilman Paul Shepherd noted that the town was charging $50 for DVD’s of town meetings. Although saying that the sessions were “boring,” which produced laughter, Mr. Shepherd said it was a matter of public information. Other board members weighed in saying only one DVD was sold last year, and all Town Board business is on channel 22 and streamed over the Internet. Mr. Reich had news about a resolution passed on Friday that authorized the town switching its email provider from Google to Microsoft. Mr. Reich said the original cost of $7 per user, per month had been cut in half to $3.50 per user by the town opting for a different level of service from Microsoft. PETER REICH PHOTO | Supervisor Jim Dougherty with Linda Holmes At the Town Board meeting December 27. 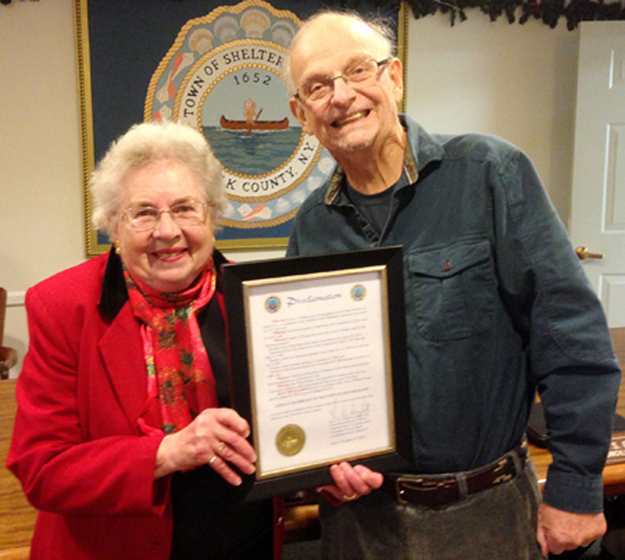 Supervisor Jim Dougherty presented a proclamation and plaque to Linda Homes at the December 27 Town Board meeting honoring her decades of selfless volunteer work and service to Shelter Island. REPORTER FILE PHOTO | The town missed a deadline so the bidding process for a major project must begin again. The gift of a second chance came two days after Christmas for construction companies seeking town business. The Town Board at its December 27 meeting unanimously passed a resolution restarting the bidding process for a major project of erosion control and repairs for the Second Causeway. It had seemed to be a neatly wrapped up deal, with the board awarding the job to Cutchogue-based Corazzini Asphalt on a bid of $507, 822. 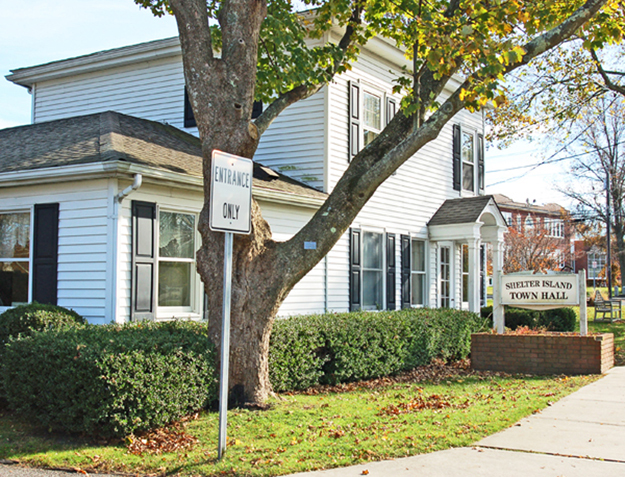 The low bidder, South Fork Asphalt, based in Southampton, which bid $376,670, had paperwork and documentation problems, and was rejected, as was the high bidder, Westhampton’s Chesterfield Associates, which came in with an offer of $639,000. But a missed deadline by the town to advertise for the job in the New York State Contract Reporter — a requirement set by the state — has moved the process into back-to-the-drawing- board territory. The project calls for reinforcing the Coecles Harbor beachfront with stone gambions, covering them with sand, relandscaping and replanting the area and paving the road. Public Works Commissioner Jay Card said after the meeting that getting the ad into the state newspaper was a complicated process and with paperwork moving between his office, the town engineer John Cronin and the town clerk, the ad didn’t make it into the trade paper. Chesterfield, the high bidder, will also most likely recalibrate its numbers with a new opportunity to bid, Mr. Card said. Mr. Card said the new bids are due back to the town by January 25 and will be opened as soon as they’re filed. The bids will then be sent to Cashin Associates, the Hauppauge engineering firm planning erosion control work on the Second Causeway for the town. Then Mr. Card and Mr. Cronin will meet and discuss the bids, before the New York State Department of Transportation weighs in. “We can then get a quick determination who we can award,” Mr. Card said. 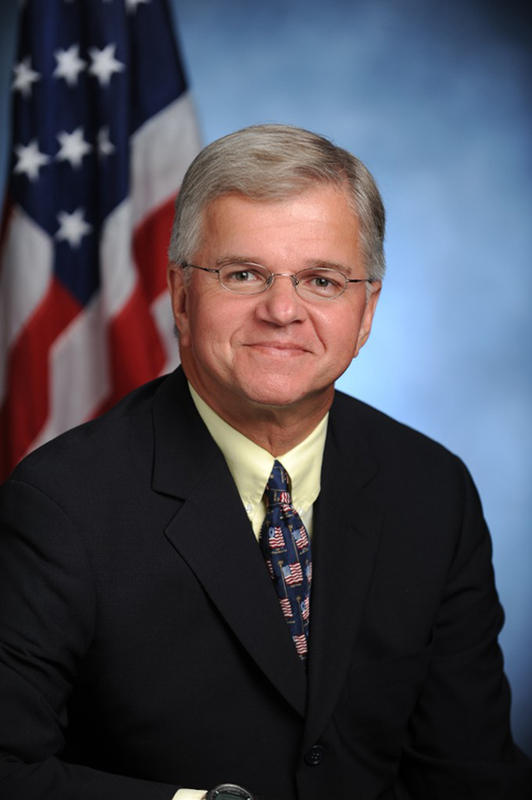 COURTESY PHOTO | Assemblyman Fred Thiele Jr. (I-Sag Harbor) is pushing legislation to take the appointment of LIPA trustees away from the governor. As efforts to shake up how the Long Island Power Authority operates takes shape here and in Albany, Shelter Island officials are taking a wait-and-see approach. With a recent presentation before the Town Board calling for legislation to empower the public to elect LIPA trustees rather than being appointed by the governor, and Assemblyman Fred Thiele Jr. (I-Sag Harbor) vowing to reintroduce a bill on the subject, Supervisor Jim Dougherty wondered at the December 11 Town Board Work Session if joining that effort would be a case of biting the hand that feeds you. Councilwoman Christine Lewis agreed, noting the Island has had a positive relationship with the power authority as it now stands, but that relationship creates problems when it comes to joining the efforts to elect trustees or keeping the status quo where the governor appoints them to serve at his pleasure. It’s an awkward position and “we don’t want to make too much of that either,” she said. Since LIPA has received a storm of outrage from many parts of the region for slow responses to people in need due to the hurricane, some top executives and trustees have resigned. R. Scott Lewis, an alternative energy supplier from Wainscott, speaking to the Town Board December 4, said accountability is essential and electing trustees will ensure that. Mr. Lewis thought he had found language in the 1985 legislation that created LIPA calling for electing trustees, and he, along with others, petitioned the Board of Elections to allow them to run for trustee posts. When the BOE refused, he took them to court, where a judge threw out the suit. But Assemblyman Thiele has a more measured approach, reintroducing legislation that calls for 17 LIPA trustees, one who will serve as chair to be appointed by the governor, and the rest elected by Long Island’s towns, certain municipalities and the part of Queens served by the authority. “It was always the intention of the original sponsors of the bill that created LIPA that the trustees would be elected,” Mr. Thiele said. The original board of trustees was appointed, tasked to serve only until they could be elected. But politics and the glacial movement of the Legislature kept postponing the provision that trustees be publicly elected, Mr. Thiele added. A similar bill on electing trustees to the one to be introduced has been around for several years, Mr. Thiele said, always passed by the Democratically-controlled Assembly, but has stalled in the GOP-controlled Senate. Senator LaValle said when LIPA was created there was a mutual agreement between officials, Democrat – including then Governor Mario Cuomo — and Republican alike to postpone the election provision of the new law. “The rationale was that we didn’t need anther layer of elected government,” Senator LaValle said, noting that the Suffolk County Legislature and the attorney general’s office already had oversight of the board. “Everything I’ve heard and seen is LIPA will be reorganized and reshaped so it’s role will be diminished,” Senator LaValle said.